these days where i find music blurs. label services, itunes, reverbnation contests, and just random submissions to our review process are all ways we come across music, so sometimes it can sit on the back burner and wait. 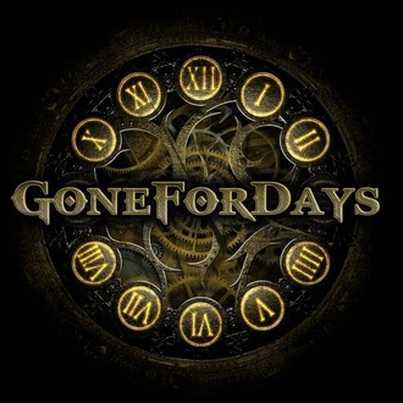 recently while putting together the new stream we’ll have up and going at the first of the month, i started listening to more and more “gone for days“. guilty pleasure. that’s the song. a bit rough on the vocals to fit the style of play, gone for days is pretty removed from “cookie cutter” type music, outside of just being good rock and roll in a time when it’s needed most. i moved the song over to “playlist” and kept listening to the rest as i don’t always have time to listen to everything, even when i like the first few i hear. while we’re putting together our new stream, i simply copy over all the music of all the artists and give FM radio the bird during the week and take the time to hear more. slap the sd card into the stereo, randomize it and we’re off and running. while guilty pleasure is certainly one of the better songs on here, you’ve got to back up and give the entire release a good review. silent will get your attention, as will falling awake. then something really cool happens. a light guitar, drums playing catch up in the distance and in come the one of a kind vocals singing “money” all about the problems we all face. and you think “maybe i found my favorite song” and then they prove you wrong. shotgun is one of those songs that simply feels at home and like a warm memory the very first time you hear it. you can see yourself living the story of living free and on the road and i can’t count the times i’ve rewound (can you do that to an mp3?) the song to start over, learn the words, dig into the meaning, and then stop yourself and just get lost in the ride of “shotgun”. hope we’ve got more coming guys. i’m certainly ready for round 2. and hell yea, shotgun will be in our new rotation, heavy play. let me know when you come to dallas, guys. dinner on me.